Well, 2017, you have arrived like a whirlwind. I am slowly catching up, but WOW life gets busy sometimes, doesn’t it? I’ll give you a little update about what’s been happening since September (it’s been awhile! ), but first let me tell you about this pulled pork. 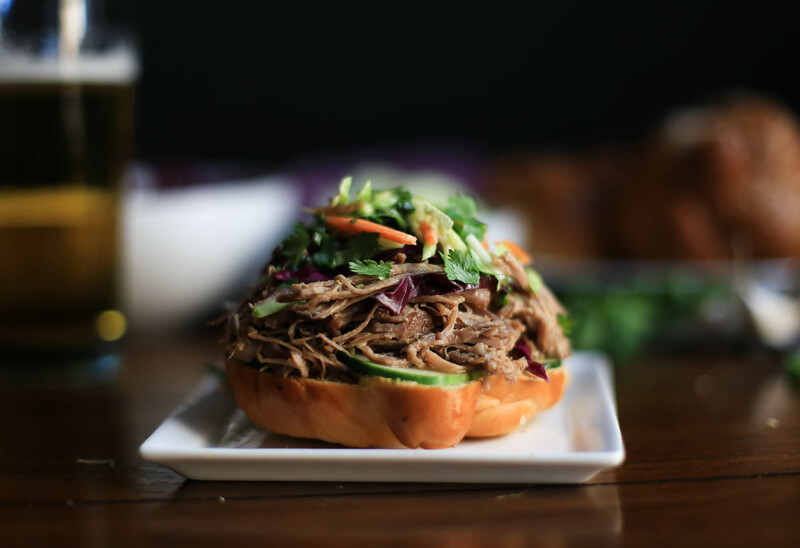 This recipe is a personal favorite of mine – sweet and spicy Asian-style pulled pork to mix up your dinner routine. Made effortlessly in the slow cooker. 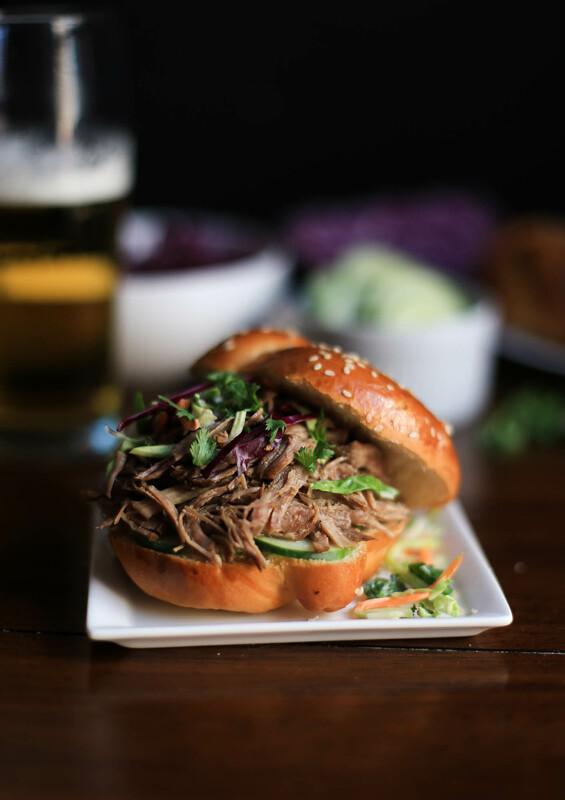 Pulled pork sandwiches are on the top of my husband’s list of all-time favorite foods. He usually prefers the BBQ version, but with this recipe adapted from Kitchen Confidante I’ve put a twist on the classic. It’s unexpected, features molasses (of all things) and tastes ridiculously, finger-licking good. So, so good. It was a big hit at a dinner party, and the leftovers were gone in the blink of an eye. I actually recommend making double, because you’ll be sad when it’s gone. You can serve the pulled pork over rice or in tacos, but here we stick to the classic: sandwiches. Sometimes family and work fill up all of your time, leaving none for hobbies such as a blog. And that’s perfectly okay. Although The District Table has been quiet lately, you can expect a full recovery in 2017. One of those New Year’s resolutions, and all that. So here’s a little update on what I’ve been up to since the last post: I got to meet my new teeny tiny perfect niece in Denver, moved offices, moved to a new apartment, painted said apartment, traveled to Wisconsin, and Buffalo, and Toronto, managed to be semi-social, and coordinated a holiday gift drive for 447 kids at work. (Humble brag – I love my job. You can read about the organization here.) This is all to say, I ran out of time to take photos of food. Or even cook, really. Thank goodness for slow cookers. 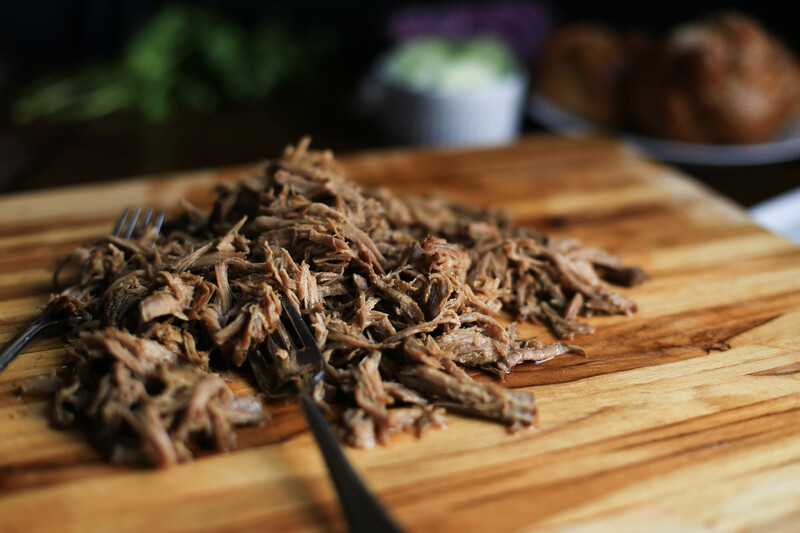 My latest greatest slow cooker creation features pulled pork, soy sauce, garlic, and vinegar. The ingredients are cooked all day, no effort on your part necessary, to the point where the pork is tender and falling apart. May I also say, thank the heavens for slow cooker liners. Talk about a time saver. And don’t go wasting the sauce left over in the slow cooker. Instead, transfer it to a saucepan, add a little molasses, and simmer to reduce. Smother the pork in the simmered sauce and plate it up. 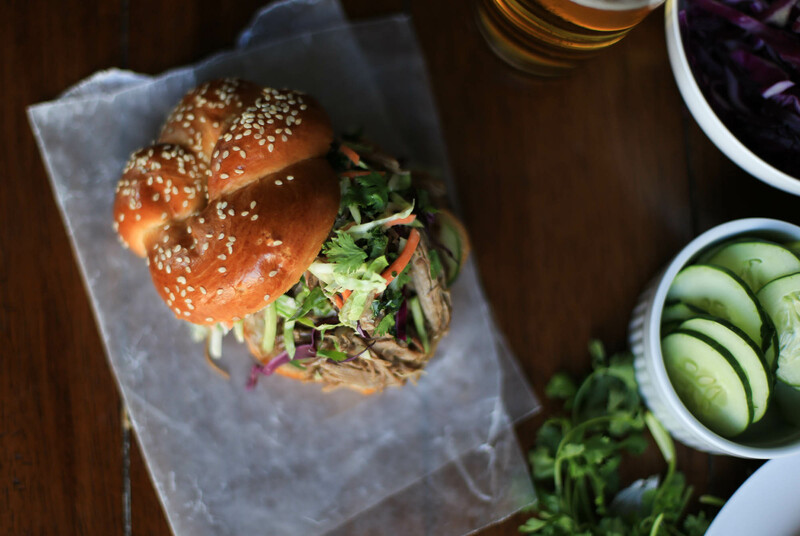 Here’s what you’ll need to assemble: buns, sliced cucumbers, slaw, and sesame seeds. And a beer, if you caught that in the photos. Yep that’s a Lazy Monk Brewing glass in the background, got to represent. For those short, 3 year-old, picky eaters out there, they may just be content with eating the pork on its own, and have a good time licking the sweet sauce from their fingers. I got to spend some time with my sister’s family of five the past year, and one thing that became apparent was that getting dinner together is no small feat. Busy parents simply don’t have the time to spend making a complex dinner. 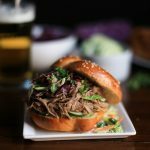 I appreciated the ease of slow cooker meals in a new way, even though I already knew they were convenient. With that in mind, searing the pork before you put it in the slow cooker is an optional step. It’s completely a matter of preference and time availability. Searing the meat beforehand builds more flavor, as the surface of the meat begins caramelizing when it hits the hot pan. Transfer to the slow cooker, then let it do its thing while you go watch Dino Train (very popular with the toddlers) or pretend to be dinosaurs or build a cave for your dinosaurs. And enjoy that extra time you have. Whisk together the vinegar, soy sauce, garlic, and brown sugar. Set aside. Pat the pork shoulder dry and season all sides generously with salt and pepper. Heat the olive oil in a large skillet over medium-high heat. Sear the pork shoulder on all sides for 1-2 minutes until golden brown. Transfer to the slow cooker. Pour the soy sauce mixture over the pork. Add the jalapeno and bay leaf to the slow cooker. Cover and cook on low heat for 7 hours, until the pork is tender and falling apart. Transfer the pork to a cutting board and shred with two forks. Meanwhile, add any remaining liquid from the slow cooker to a saucepan. Stir in the molasses and bring to a boil. Reduce the heat to simmer for 5-7 minutes until the liquid has slightly reduced. Strain through a sieve and then mix into the pork. 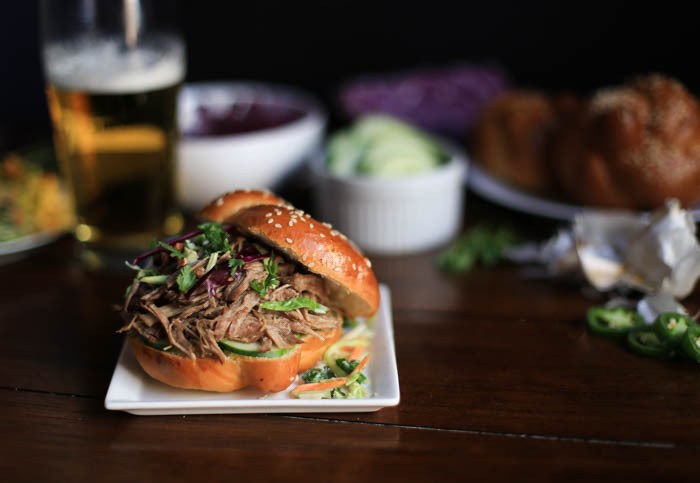 Serve on buns with sliced cucumber, slaw, sesame seeds, and cilantro. There are a couple of optional steps: searing the meat before placing it in the slow cooker is optional, though it does build more flavor. Also, you may choose to rotate the pork halfway through the cooking time in the slow cooker, if you happen to be at home.